Eva Taylor has been locked in an attic for 4 years. Failed by the foster system, and left in the hands of a woman who hates her, and a man who wants her, Eva has given up hope of ever having a life. When she finds a mysterious letter from Rothmore College addressed to her in the trash, Eva's future suddenly comes alive. Now all she has to do is figure out a way to escape her attic prison, make her way across the country to New York City, and figure out all the things that point to the fact that she isn't exactly normal... Along the way Eva meets new friends, explores new places, and stumbles across three beautiful, charismatic, and alarmingly otherworldly men. Do they hold the key to Eva discovering who she really is, or are they just good at first impressions? Eva has always had this strange pull on people. It's why her foster parents locked her away. Finally she has her chance to escape. Somehow, she's been accepted into Rothmore College on a full scholarship. She just has to get there. Once she does, she finds herself in a whole new world. Finally free, she starts to make new friends and learn new things. Can she really trust these new people in her life though? 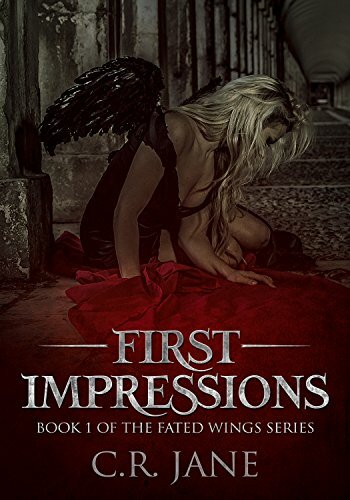 This is the first book in The Fated Wings series and I was very intrigued by it. Eva is a bit of an odd duck. She's been locked away for so long that she's not up on social cues. She doesn't seem to notice the amount of attention she gets or when she does, she doesn't understand why. She meets Damon, the football star, who is drawn to her. While he's a bit obsessive, he's trying to play it cool and takes things slow. Mason pops in next. He's the rockstar. Meeting Eva turns his world upside down. Then there's Beckham. We only get to meet him for a second but boy does he make an impression! I will say this as a small warning for some, these boys are not innocent little angels when she meets them. They are downright dirty rotten scoundrels when it comes to women. However, Eva seems to be the thing to tame these wild boys. So we know that the guys are some type of paranormal. We just don't know what. We know that they are best friends who like to live in the spotlight and soak up all the attention they can get. That they've been around for a very long time. Everything else is all a mystery. One that I hope we will unlock in the next book after that jaw dropping ending. I think this was a good start to this new, slow burn, paranormal series. Another one where the ending has you screaming for the next book. You can keep up with C.R. in her facebook group here.